That’s what two journalists, both from major financial news outlets, recently asked me. I must admit — I wasn’t immediately sure how to answer. Cryptoassets are a budding industry rooted in the nascent blockchain technology. Naturally, it is facing many fundamental challenges. How do you pick one that’s the biggest? It took me back to the early days of Solidus Labs, about a year ago. My team and I left Goldman Sachs knowing we wanted to create value by bridging traditional finance and the new digital economy. We were passionate about blockchain’s ability to transform financial services, but when we looked around we saw a deeply fragmented ecosystem. When we tried to sketch a trading workflow for blockchain-based assets, 75% of the steps were missing or severely lacking. The task of filling the gaps seemed daunting. Thankfully, we were inspired by the many ambitious trail-blazers who were already working day and night to build both infrastructure and services advancing a complete and mature blockchain ecosystem. We dived right in, and thinking about the year since and its conversations, research, ideation and execution, I realized I have a good answer for the two journalists:  It’s not about the the biggest problem — there are simply too many major challenges for cryptoasset trading. The real question is what are the biggest problems we, as an industry, can actually do something about today. 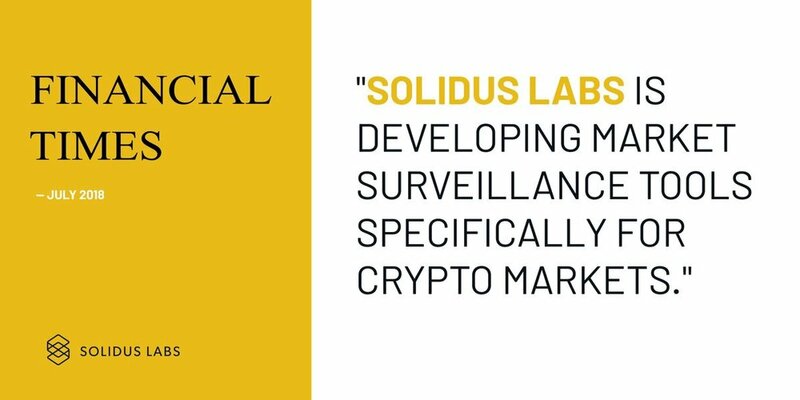 For us at Solidus, the answer crypto-native trade surveillance: Tools tailored specifically for blockchain-based financial services, to combat the vast amounts of manipulation in crypto markets. There are numerous unknowns: Regulatory uncertainty, technological challenges, public perception and more. However,  instituting surveillance into their systems is something every broker dealer, market maker, hedge fund or exchange can do as soon as tomorrow, regardless of the unknowns, to create an ecosystem safer from abuse and manipulation. There’s a handful of companies and organizations leading the discussion on trade surveillance to tackle crypto market manipulation. As one of them, we had the pleasure of engaging with multiple market participants in order to create a robust, inclusive and safe trading ecosystem for digital assets. Those market participants include newly formed crypto companies and traditional wall-street firms whose leadership is set on adding cryptographic digital assets to their portfolio. Two critical categories of companies are emerging: Infrastructure companies, and service companies. Among infrastructure companies, you’ll find those looking to deliver instant off-chain payments confirmation, crypto-based custodians, tokenized securities, debt and swap issuance, OTC (over-the-counter) markets, distributed networks of oracles, and last but not least decentralized exchanges and centralized exchanges exercising different forms of on/off chain order-books. This list, though it’s not short, includes only a few of the space’s up-and-coming vertices. Simultaneously, service companies are on the rise, offering market making services, brokerage of non-deliverable forwards, ETFs, derivatives, futures, loans, swaps and other ways clients can engage with, and gain value from, blockchain-based assets. To create a comprehensive and safe trading environment, services and infrastructure companies in the world of cryptoassets must work together. The common denominator for all of these companies is that they all face the challenge of market manipulation. Manipulation is not a possibility, it’s a probability, maybe even a certainty. It’s easy to understand why:  The more complex the system, the more opportunities exist for sophisticated malicious actors to try and take advantage of others. In a trading system where, for example, smart contract-controlled oracles determine dividend payoffs for tokenized securities, a strong market surveillance system is absolutely acute to ensuring fair play. The bottom line is that the opportunity for manipulation in cryptoasset trading is enormous, and detecting it requires different technology, knowledge and thinking than traditional markets. Keeping that in mind, Solidus Labs, since its founding, spent considerable time and resources preparing the for the future of digital asset trading. We’re not thinking just about  what manipulation means today, but are also laying the groundwork for detecting crypto manipulation as it will manifest in the near, and far, future. From block-level manipulation, through smart contracts fraud to abuse of e-wallets, oracles, and other trading- facilitation frameworks which are all promising, but increase the potential for fraud. We are developing solutions for problems that, in some cases, have yet to take place, but will surely do. Admittedly, this is one of the biggest — and most fascinating — challenge in our work. To be clear, Solidus Labs wouldn’t be able to be where it is today without its partners, advisors, clients, and other supporters. We’re advocating for higher standards of trading in a space that’s currently in disarray, and it’s not a one-man, nor a one-company, job. It’s the collaborative and creative blockchain and crypto community that constantly pushes us to continue working on our modest contribution — a trade surveillance infrastructure for cryptoassets. We’re proud to be members of a community that is aware of the big challenges it’s facing, but rather than being daunted, focuses first on the problems that can be solved right now. The question we should be asking is not what’s the biggest problem facing cryptoasset trading, but what’s the biggest problem we, as an industry, can do something about right now. Infrastructure and service companies must work together if we are to achieve a comprehensive and safe trading environment. The more complex a trading system, the more openings for manipulation. Blockchain-based trading systems are very complex. Detecting manipulation in cryptoasset markets requires specialized, crypto-native surveillance. Trade manipulation is not a possibility, it’s a probability (maybe even a certainty). We must not only address crypto manipulation today, but what it will look like in five and ten years. Though cryptoasset trading is shrouded by many unknowns, instituting trade surveillance can be done TODAY to ameliorate manipulation and demonstrate good will to investors and regulators.